Dave Carroll is a young up and coming actor currently studying drama at the National Theatre. In between appearances on Neighbours and several shows around town he is also a personal trainer, fitting in well with his interests in health and well being. I started off Vego but am lactose intolerant so the switch to vegan wasn’t too big a step. Seeing as my main motivation for not consuming meat was cruelty to animals as well as sustainability, I started to realise that boycotting meat wasn’t really enough. If I’m still eating eggs, no matter how free-range the chickens are, nearly all the male chicks are killed when they’re born. I don’t think we have the right to dictate what species live and die and what conditions they exist in. My main gripe is being a fussy eater. I never have been, I was raised to eat everything and I hate that now I could be classed as such. I hate having to ask what the ingredient of things are. But that’s my hang up that I’m slowly dealing with. The other is the lack of speedy fast food, I eat HEAPS and often on the go and there’s only so many salad sandwhiches a boy can eat. Plus getting away from the CBD options are slimmer. That and vegetable soups in supermarkets. It is ridiculous how many animal ingredients are snuck into these. And while I’m on the topic, the constant ‘eat meat’ and ‘eat dairy’ adds out to brainwash people. These are million dollar industries only concerned with making money. Sam Neil you are a sell out for your filthy commercials scaring kids into eating red meat! I don’t push my values on your kids! My family all had mixed reactions, there are a fair few of them. I have copped some flack from some that I thought would be more supportive. It is exhausting when I am forced to defend my choices when I never abuse them for choosing to eat a steak for lunch. And I’m also frustrated when there is no effort made to cater for me as a vegan, we are quite easy to cook for and I will eat ANYTHING that doesnt come from an animal. Having said that my mum has quite enjoyed the challenge and has whipped up some creations that I myself haven’t even attempted. I’ve had a few friends who were vegetarian who originally inspired me who I in turn have inspired to go the next step to vegan. It’s nice to return the favour! And I’ve had many carnivore mates who’ve happily tagged along to a vegan eatery with me and really enjoyed the experience! In a big way and for me completely positive. I have much more energy than I used to, I have become very aware of what I eat and made sure I eat a variety of fresh and healthy foods. I have much more appreciation for the foods I cook with and it has lead me to experiement with different flavours and syles and to make sure I receive all the nutrients I need from vegan sources. Splash some olive oil into to a hot pan. Add sliced onion and garlic and cracked pepper. After a couple of minutes add organic brown lentils and kidney beans or a four bean mix. Then add either a can of chopped tomatoes or a punnet of cherry tomatoes (these are heaps fun cos once they are roasted you can smash them open when you’re eating). Stir through a heap of baby spinach and a splash of balsamic. Once the spinach has slightly wilted pour over penne pasta or stir thru spaghetti. Yum. Serve with home-made garlic bread…garlic cloves and vegan margarine are your friends here. No rules, just make it up as you go. Another one is vegan cheese cake, I dont have an exact recipe for this either but if you whip up equal amount of firm silken tofu and ‘fake’ cream cheese (such as the Tofutti product Better than Cream Cheese) add some fruit and pour over a biscuit base then heat and cool you can’t go wrong. As far as take-away goes I prefer to cook, but when I’m feeling lazy some of the Asian mock meat restaurants are very hard to beat. It feels a bit wrong ordering chicken, fish and sweet and sour pork, and even a little wronger eating it, but amazing flavours and just goes to show us vegans ain’t missing out on nothin! My favourite reaction is when people say I look way too healthy to be vegan. They expect me to be scrawny and pasty. That’s a stereotype I’d love to break. But when I talk to people about my choices most of them have been quite interested. I hope to show people an alternative choice rather than shove an opinion down their throat. My dog Misty and my horse Salem. Both have now passed on, but two amazing selfless animals who made my world a better place, showed me how much we can learn from other species and made the idea of inflicting suffering on any other creature stupidly unbearable. I think for all venues to have at least one vegan option on their menu, and to label this would be a good start. these days people are very health conscious and many people suffer a variety of allergies. A vegan meal is often one that can cater to most peoples dietary requirements. Apart from that, I feel it’s up to us vegans to educate our mates as to what being a vegan is in a non-threatening way, so people feel comfortable to learn more and have a crack at eating what we eat. The benefits speak for themselves! 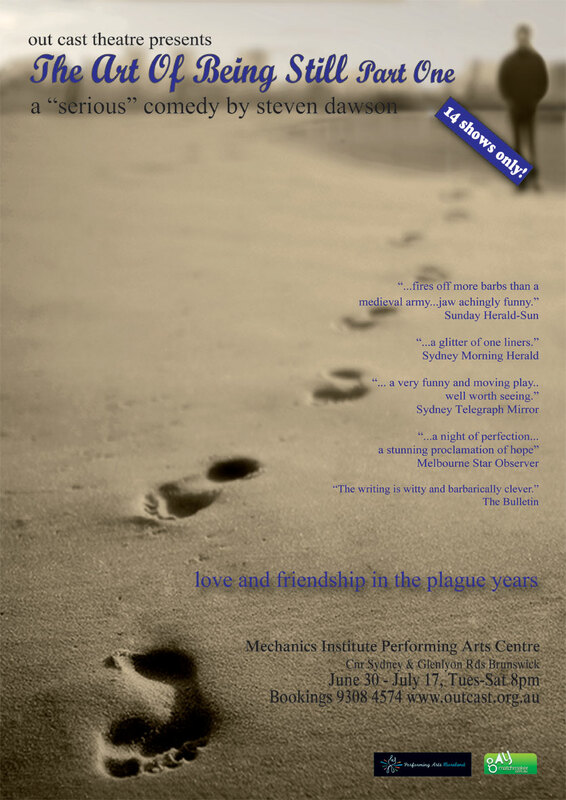 Dave is currently appearing in The Art of Being Still at the Mechanics Institute in Melbourne.